Xiaomi Corp, the Chinese smartphone manufacturer, announced having sold 61.12 million smartphones during CY 2014 on Sunday, which is a phenomenal increase over the 18.7 million devices sold by them during 2013. The company founder and Chief Executive Officer Lei Jun mentioned in a Weibo update that their revenue was up 227% over the previous year. Meaning ‘millet’ in Chinese, the Xiaomi Corp was set up only four years back in 2010. Though initially founded for making software for Android powered devices (MIUI ROM), the company later forayed into smartphone manufacturing. In addition to that, they have also released a tablet device, TVs that connect to the internet and a television set-top box. Establishing themselves as a brand in the smartphone market dominated by Apple and Samsung, however, and making sales to the tune of 74.3 billion yuan ($12 billion) is their biggest achievement. According to data provider Strategy Analytics, the Beijing based company is now the third largest player in the smartphone market with their market share having risen from 2.1% to 5.6% during Q3 2014. “In the past year, we have achieved results that we are extremely proud of. 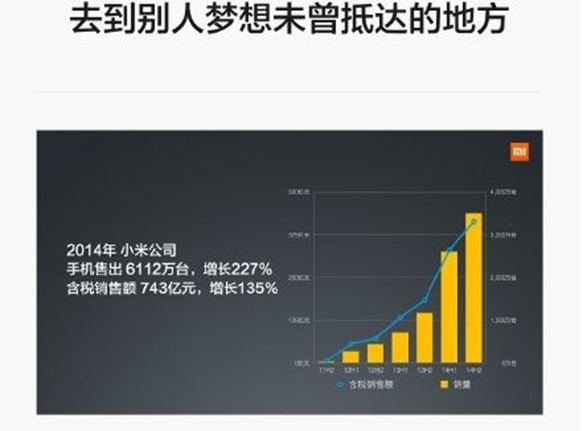 In 2014, Xiaomi sold 61.12 million smartphones, an increase of 227% from the year before; and tax-inclusive sales was CNY 74.3 billion, an increase of 135% from the year before. We have successfully become the first in China’s smartphone industry in terms of market share,” Lei said. The company had earlier gone on to become the most valuable private technology startup in the world after a round of funding in which it raised $1.1 billion against a valuation of more than $46 billion. The CEO mentioned that in his blog post too. Those who pumped fresh capital in the last round of funding include Milner’s DST, Singapore’s GIC Pte and All-Stars Investment Ltd.
Lei made it clear that the company, which now sells its products across countries and regions besides mainland china, will further expand in the coming year, with a special reference to having sold a million smartphones in India alone over the last five months. The ban on it following Ericsson lawsuit over violation of patents notwithstanding. Upbeat after having scaled new heights, Lei has set loftier targets for the year 2015 and says he hopes to be able to sell 100 million smartphones over the period. He is fully aware of the increasing competition in the market. “In 2015, the smart devices playing field will become extremely competitive, especially as the growth of the smartphone industry in mainland China slows down,” he said while also referring to rivals trying to emulate their business model- obviously, a reference to OnePlus which is also selling its devices exclusively online like Xiaomi. The manufacturer now plans to release their Redmi smartphone soon and will hold a press conference on Jan 15 in connection with the same. Billionaire Yuri Milner, who has invested heavily in the company, believes that the Chinese startup which is yet to go public has the same potential as Facebook Inc. and Alibaba Group Holding Ltd.
Milner has been particularly impressed with the company having reached the $1 billion revenue benchmark faster than both Alibaba and Facebook. Milner has been an early investor in all the three aforesaid companies. Though Lei has not mentioned the regions over which they hope and aspire to launch their products, there is no doubting the fact that everyone on their team is exuberant at having touched unprecedented sales figures over the previous year. Given that they are coming up with more models soon, that the market for smartphones is rapidly expanding and that their devices are loaded with features while being priced reasonably certainly makes 100 million target look reachable. The English translation of his post was made available on TechInAsia and can be seen here. India Smartphone Market–Huge future potential!